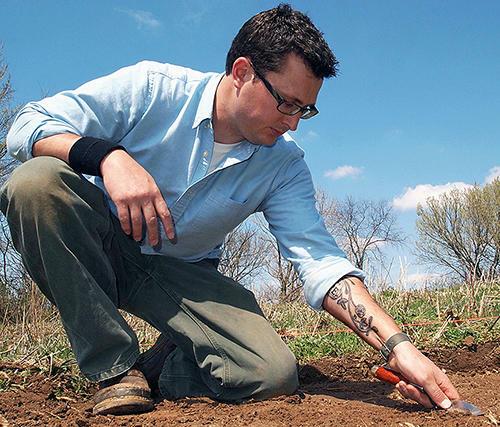 Aaron Deter-Wolf inspects an archaeology site in this photo from the Tennessee Division of Archaeology. MURFREESBORO, Tenn. (WMOT) -- Millennials, now pushing into their 30s, are making the once taboo art of tattooing fashionable, but rather than a departure a mid-state archeologist says the trend is actually a return to a common human practice. Aaron Deter-Wolf is a pre-historic archeologist for the State of Tennessee. Deter-Wolf has made himself something of a world authority on tattooing. He recently helped identify marks on a 5300-year-old mummy found frozen in the Austrian Alps as the oldest known example of tattooed human skin. Deter-Wolf says the Native Americans who lived centuries ago in what is today the State of Tennessee also practiced tattooing. He says the marks denoted important rites of passage, heroic deeds, or religious symbols. He notes the practice began to fade when Europeans arrived in the region. Ötzi the Iceman, a 5,300-year-old mummy discovered in 1991 within 100 yards of the Austria-Italy border, bears the oldest known evidence of human tattoos. 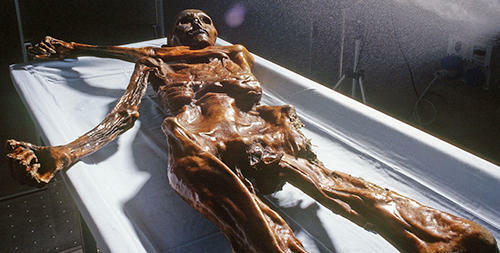 The refrigerated mummy is sprayed with water, encasing the corpse in a cocoon of ice simulating the glacial conditions that have preserved him for centuries. Deter-Wolf is also an adjunct professor at Middle Tennessee State University where he teaches a course in the anthropology of tattooing. He says, to the best of his knowledge, it’s the only class of its kind offered anywhere in the country.